I deliberately started half-way through, with puzzle 10 Dutch Loop (25), to avoid rule confusion with the similar puzzle 9 Masyu (40). I got through it smoothly, just like the Loop with Symmetrical Segments (30), a type which seems pretty resricted – I have yet to see an instance of the type that isn’t logically straightforward. Precise logic eluded me on the Country Road (50), but I got through well enough with a bit of guessing and uniqueness logic. The Castle Wall (50) on the other hand was more of a slow and steady logical solve, dominated by searching for the next clue that gave information. I had probably better skipped the following Arrow Maze (45). I did get it out ok, but it’s not a type that suits me, so the time could likely have been spent better. 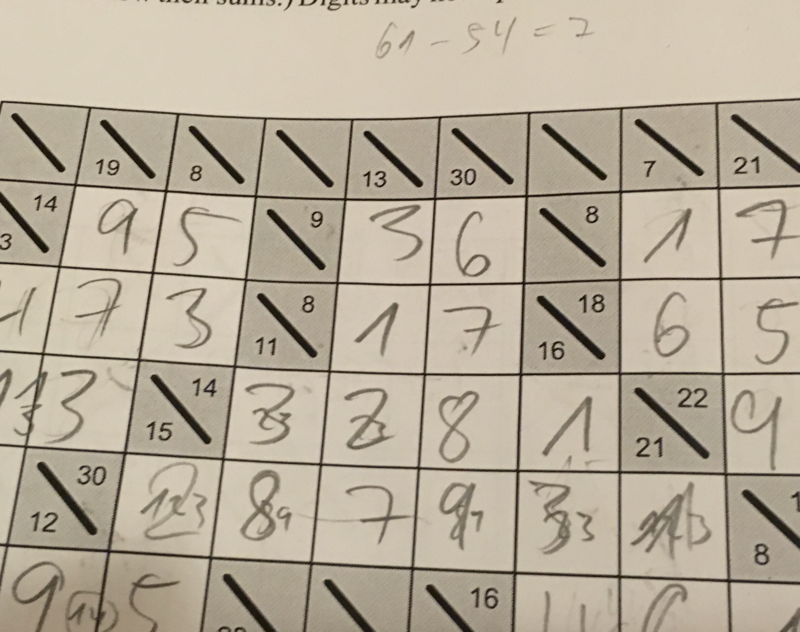 I skipped the trivial Password Path (5), and finally solved the last puzzle of the round, a Yajilin (45), which went half clean half guessed. At this point it was time to tackle the remaining high pointers. One was a thematically amazing 9×9 Slitherlink (100). This was a caseworky puzzle, but it turned out manageable enough for me, pulling on the right threads, and never going more than a level deep. Next to this was a straightforward but pleasant and pretty 2018-themed Slitherlink (25). Then I moved on to the starting puzzle of the round, a Czechia-shaped Every Third Turn Path (60). This wasn’t particularly difficult, mostly a large puzzle. In the remaining few minutes, I solved an Every Third Turn Loop (15) and Land and Sea (25), couldn’t get the Snake (25) with odd/even clues out. This was another ill-instructed puzzle: The odd/even rule was not mentioned in the instruction booklet or example. Clear enough to me, but what about the players who don’t speak English? Finally I got two pretty simple Arukones (5, 5) out, and the round was over. I missed the Snake (25) (finally resolved my contradiction today! ), the Password Path (5) and Masyu (40), which was tricky but otherwise unremarkable. Thankfully, I was clean of errors in this round, and it turned out to be my best result relative to the competition with 116% of the 10th score. Next up another round that ought to suit me. Not so much due to the dissection theme, but because of the many Pentomino puzzles. I started with the first puzzle, Pentominoes I (110), which involved covering the Czech map with two sets of pentominoes. It took a little bit to get started, but the solved cleanly enough. Next up two Pentominous puzzles, under the names Pentominoes II (30) and Pentominoes III (55). The first is otherwise known as Pentominous Walls, the second regular Pentominous, but perhaps the authors weren’t aware of the standard name. Pentominous is a type that usually really suits me, but instead things went downhill a bit: I broke into the first one logically well enough, and then reached a convincing contradiction half way through. After quite a while of trying to fix this, I moved on to the second one, sort of broke in from the wrong corner, then noticed the real entry in the top left, and managed to freeze my brain again. 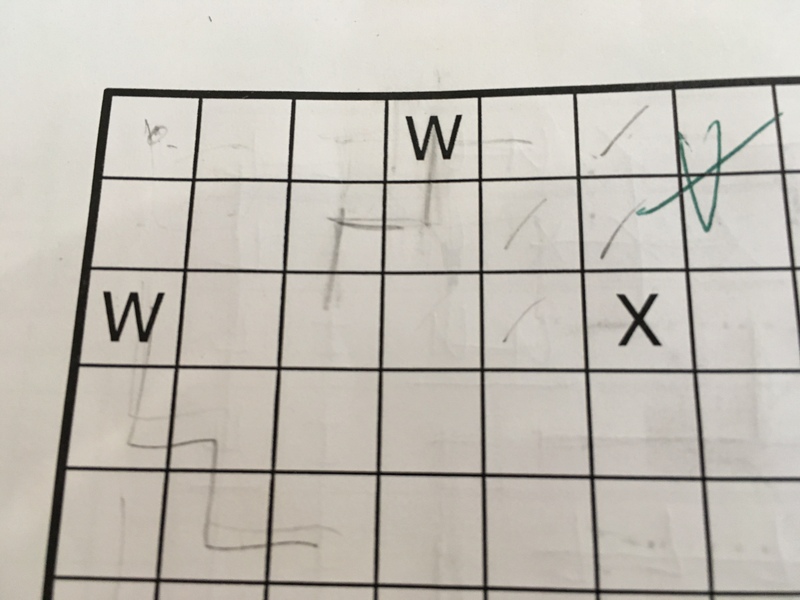 I had close to the correct solution out initially, saw it didn’t quite work, and at some point my brain switched to be convinced the upper W wasn’t allowed to touch the X. I kept this up until showing the puzzle to someone else a day or two ago. 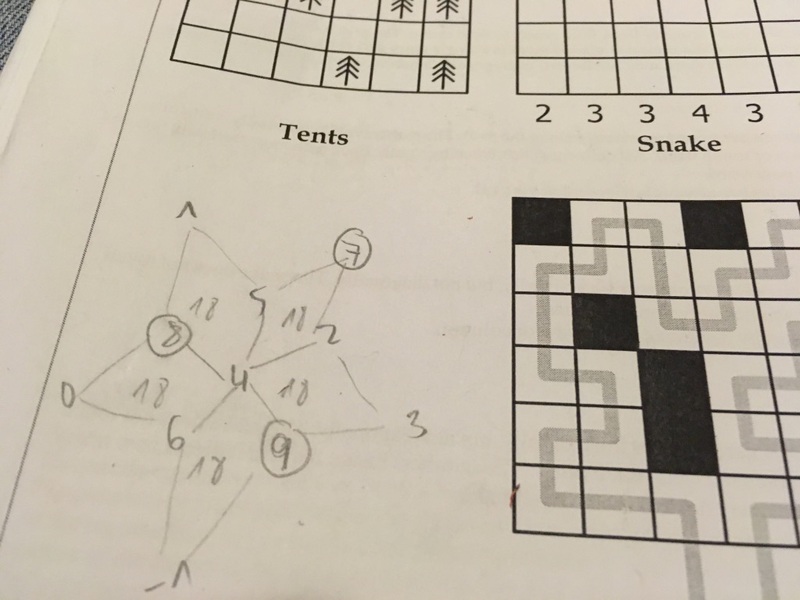 At this point I wasn’t feeling great about my solving. I moved on, not spending too much time on Pentominoes IV (65), which involved dissecting a grid into a full set of pentominoes. I found the right end to pull on soon enough, placing the X correctly and everything fell into place. I then skipped the Square Tiling (20), got the Slash Pack (25) out quickly, and sunk some time into an impemenetrable Coded Dissection (50). I was since spoiled on a logical break-in, and it does resolve nicely that way. Next up Dissection by Vertices (50), which came out quickly with a bit of luck. Making a practice puzzle here helped, if just so I didn’t expect too much logic. The following WPC-themed Galaxies (30) was easy but fun. On to the last two puzzles of the round. Puzzle 10 was a Tetrominoes End View (45), keeping with the theme of naming puzzles which reference the second item “End View”. This one had a nice break-in along the top left, before rapidly running out of clues. I’m still amazed by how the puzzle resolves in the end – beautiful. Finally I chose to brave the Burokku (100) despite finding a high-valued puzzle of that type terrifying. But I was almost out of puzzles that I hadn’t proved unsolvable, so what choice did I have. Thankfully I found a good mix of logic, intuition, luck and tweaking that got me through this one well enough. It did not feel like a realiable solve at all though! The final minute or two of the round was spent on the square tiling puzzle, but the solution eluded me. Ultimately, this was round that ended with a decent result despite serious trouble, with 88% of the 10th result. Could have been a lot better though. Congratulations to my neighbor Matej for finishing this one! The last round before lunch was up next, themed “numbers”. Not particularly up my alley, although there were enough types here that I felt comfortable with. I skipped the first Czech-shaped number distribution puzzle, which was similar in style to Puzzle Picnic’s Sum Thing (while technically the same as Letter Weights/ABCtje). The type was a bit error-prone due to the way it handled diagonal touching – this had already confused me in the example. I’m not even sure I’m slow at these kinds of puzzles, but I definitely don’t enjoy them under time pressure. This one has some reasonably standard but nice logic, quite enjoyable after the round. Place all the numbers from 499 to 506 in the empty cells so that the sum of the numbers on the vertices in all five quadrangles is 2018. The core of the star is brighter, so the sum of the 5 numbers on the circle is 20 higher than the sum of the 5 numbers on the ouside. On to puzzle 3, Doubleblock (55), the first of the type on the competition, so I didn’t know yet to expect them to be devoid of logic. This one had a nice 2018 theme in the clues, and apart from that, I suppose it’s a valid puzzle. I put a little bit of time into it, but after needing 3 or 4 guesses to get to my first contradiction, I moved on. Next up a large Kakuro (125). This one had four outer regions, connecting to an inner ring with 2-cell overlaps. Not finding clearly forcing restrictions, I filled the outer regions somewhat arbitrarily to easily calculate the overlap sums. I think two out of the four ended up correct right away, and one just needed minor tweaks at the end. Then more experimental solving in the middle with the aim of calculating the delta between two narrow points on the ring, which directed me at a proper break-in: the top middle left over some 4 cells in a 2D arrangements with a minimal sum. With some similar logic in the bottom half, this one came out quite well, though in retrospect I’m not sure whether I mostly just got lucky. Can you find the break-in? I then skipped forward past Futoshikis and Sandglasses to some Pyramids (15, 65), where I thought I should do well with croco-puzzle experience. That seemed correct, unfortunately the sloppy errors started coming back. Next two very easy Mathrax (25, 25) puzzles (I’m used to Richard’s work here which always leads me astray). I broke one of these, too, by a single wrong digit. Next came my highlight of the round, a wonderfully constructed 9×9 Tom Tom (90). The break-in required worked along all four edges, and it took me quite a while to see how this part was resolvable at all. But very satisfying to figure out, and the rest of the solve kept me on my toes. I made one mistake towards the end which I was thankfully able to repair. Next a neat smaller Tom Tom (35) that relied on the non-standard restriction on non-negative integral results for all cages. 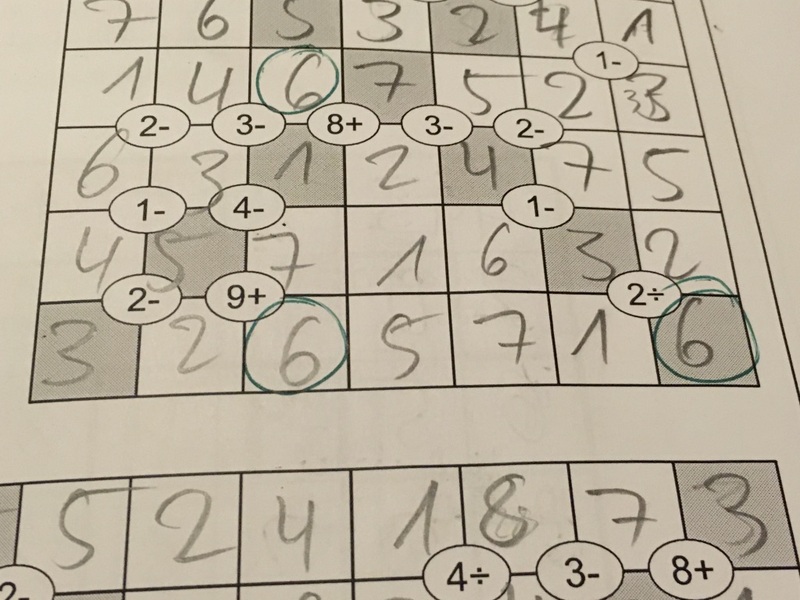 I basically figured this one out, but made a mistake (a proper one) resolving it. With little time left on the clock, I passed on the final Antimagic Square (80), though that seems like good points for time for a puzzle with limited casework. Instead, I flipped back and got the smaller Futoshiki (25) out easily. I’d like to say I spent the rest of the round checking, but judging by the Pyramid that can’t have been the case. Among the left-overs, the large Futoshiki (80) was a very pleasant solve; 9×9 with a WPC theme. And then there were the two Sandglass (25, 25) puzzles. 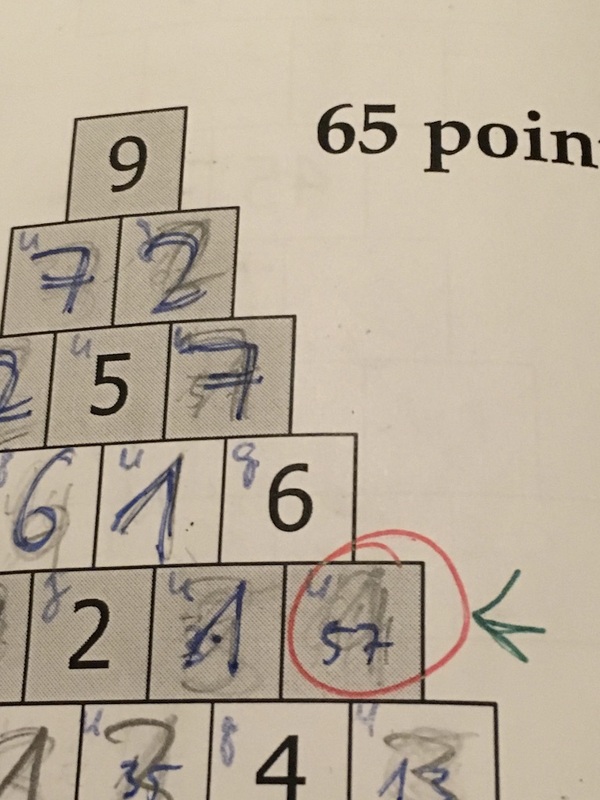 The first one was pure casework as I expected after the example puzzle, but the second and larger one actually had some non-trivial forced numbers. All in all, a poor round for me with 68% of the 10th result, a combination of errors and aptitude, somewhat saved by the Kakuro and Tom Tom. And once more, time for the lunch break.